Based on specific information, Army and Kokrajhar Police launched a joint operation on 11 January 2016 in general area of village Islampur, in Kachugaon. 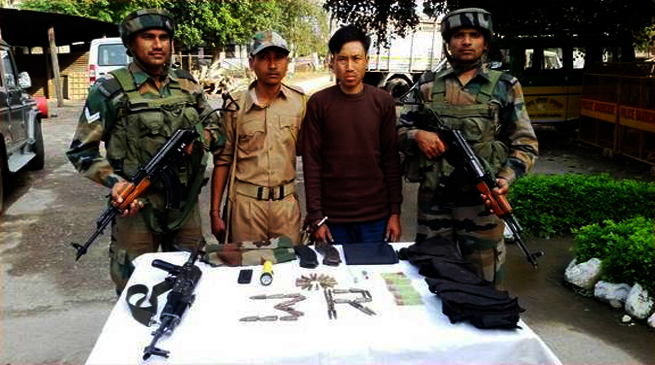 During the search operation, one NDFB(S) terrorist was apprehended who was identified as Willbe Rabha @ Rhasong. The terrorist had been part of Bidai and Batha group of NDFB(S). He was a 40th batch cadre of NDFB(S) trained in Myanmar and was actively involved in various cases of extortion, recruiting and training of NDFB(S) cadres. He was also involved in the Adivasi carnage in Dec 2014. One AK-56 rifle, 58 rounds of 7.62mm ammunition and two magazines were recovered from the apprehended terrorist. “It is pertinent to mention that due to the unrelenting pressure exerted by the Security Forces, the cadres of NDFB(S) left after the near decimation of the group, have been lying low but they are on constant look out to regroup, but this has been made impossible due to the high momentum of operations by the SF’s”.